Pre-Assembled Hand-Rail ....... Experience the Difference! Railing USA is a quality fabricator of Premium Pre-Assembled vinyl railing for the residential and commercial building market. 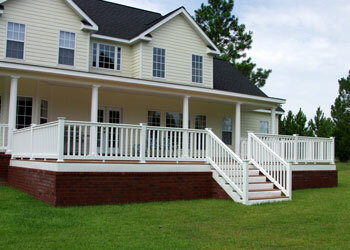 Our railing is designed, manufactured, and engineered to be one of the best values on the market. Composed of rigid polyvinyl chloride (PVC), its UV inhibitors and additives make it impervious to the elements. Our railing is produced and fabricated under exacting quality control checks. The combination of strength and good looks is exactly what you will find at Railing USA. INSTALATION AS EASY AS 1...2...3. 1. Remove Pre-assembled Railing Section from Carton. 2. Set in Place and attach Pvc Brackets to Pre-assembled Section. 3. Secure to Columns or Newel Posts with Stainless Steel Screws.